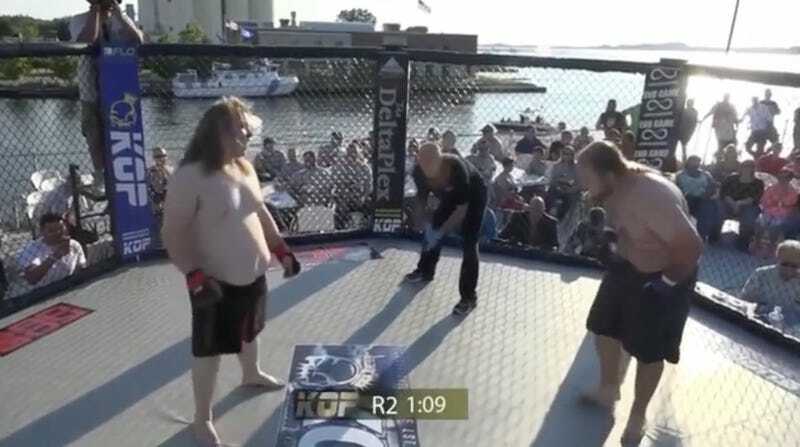 Last weekend, Michigan-based fight hosts KnockOut Promotions held something resembling an MMA bout between Jesse Reasoner and Sean Needham. It took place in the super heavyweight division and both amateur fighters weighed in at over 270 pounds. Although the fight was held on the water in Muskegon, Mich., it was an ugly slog of a fight that ended suddenly when Reasoner started barfing all over the octagon. If you’ve come this far and somehow need to be warned, okay: the video is gross because it features someone barfing all over the octagon. To make this unfortunate, sour display somehow worse, this was just the first fight of the night.